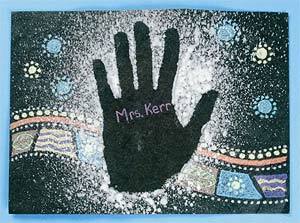 The stenciled hand print and aboriginal style drawings help children to relate to the man from the Australian Aboriginal Culture stated above, while helping them to understand the use of line in art. A black paper with white splattered paint was used, but white paper with red (ochre) splattered paint would make a nice impression also. Construction paper crayons make bright, bold, linear designs around the hand stencil. Show several examples of Aboriginal art. Explain to the children how the artists use the 9 lines in their art - long, short, curved, straight, thick, thin, loop, zigzag and dot. Use a scrap piece of paper and have the children trace their hand and cut these out. Tape the hand from the back, using a "doughnut", to a piece of construction paper. Using a squirt bottle, water down tempera paint, about 2 parts paint to 1 part water. Squirt lightly around the hand. Let dry thoroughly. Remove the hand. Using construction paper crayons, let children decorate their hand stencils with Aboriginal designs. Black or white Construction Paper, 8½" × 11"